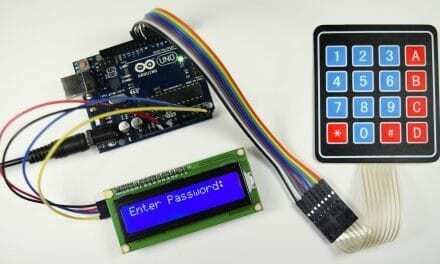 In this article, I’ll show you how to make three different range finder circuits for the Arduino. The first range finder circuit is easy to set up, and has pretty good accuracy. The other two are a bit more complicated, but are a bit more accurate because they factor in temperature and humidity. But before we get into that, lets talk about how the range finder measures distance. Ultrasonic range finders measure distance by emitting a pulse of ultrasonic sound that travels through the air until it hits an object. When that pulse of sound hits an object, it’s reflected off the object and travels back to the ultrasonic range finder. The ultrasonic range finder measures how long it takes the sound pulse to travel in its round trip journey from the sensor and back. It then sends a signal to the Arduino with information about how long it took for the sonic pulse to travel. In the equation above, it’s clear that temperature has the largest effect on the speed of sound. Humidity does have some influence, but it’s much less than the effect of temperature. To initiate a distance measurement, we need to send a 5V high signal to the Trig pin for at least 10 µs. When the module receives this signal, it will emit 8 pulses of ultrasonic sound at a frequency of 40 KHz from the transmitting transducer. Then it waits and listens at the receiving transducer for the reflected signal. 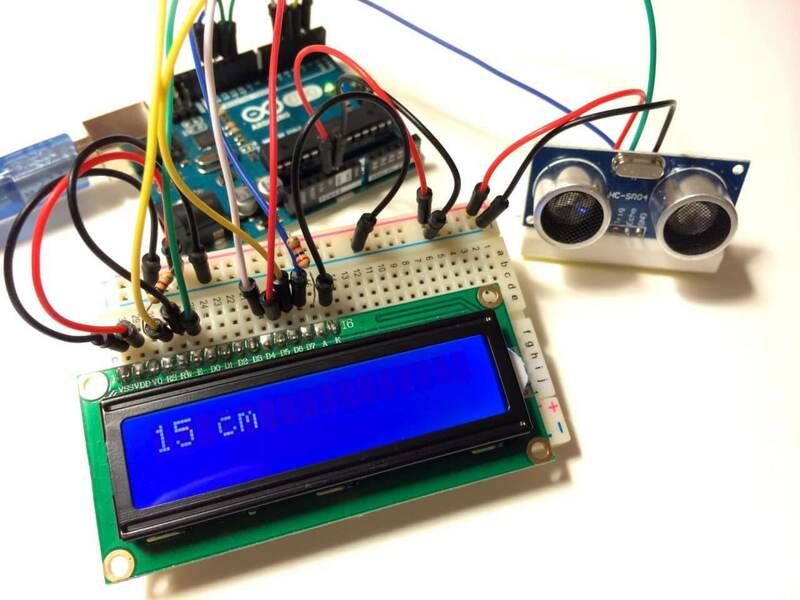 If an object is within range, the 8 pulses will be reflected back to the sensor. When the pulse hits the receiving transducer, the Echo pin outputs a high voltage signal. The length of this high voltage signal is equal to the total time the 8 pulses take to travel from the transmitting transducer and back to the receiving transducer. However, we only want to measure the distance to the object, and not the distance of the path the sound pulse took. Therefore, we divide that time in half to get the time variable in the d = s x t equation above. Since we already know the the speed of sound (s), we can solve the equation for distance. Line 11: Declares the variables duration and distance. Lines 12 and 13: Sends a 2 µs LOW signal to the trigPin to make sure it’s turned off at the beginning of the program loop. Lines 15-17: Sends a 10 µs HIGH signal to the trigPin to initiate the sequence of eight 40 KHz ultrasonic pulses sent from the transmitting transducer. Line 19: Defines the duration variable as the length (in µs) of any HIGH input signal detected at the echoPin. The Echo pin output is equal to the time it takes the emitted ultrasonic pulse to travel to the object and back to the sensor. Line 20: Defines the distance variable as the duration (time in d = s x t) multiplied by the speed of sound converted from meters per second to centimeters per µs (0.0344 cm/µs). Lines 22-24: If the distance is greater than or equal to 400 cm, or less than or equal to 2 cm, display “Distance = Out of range” on the serial monitor. Lines 26-30: If the distance measurement is not out of range, display the distance calculated in line 20 on the serial monitor for 500 ms. Note: the value of R1 should equal the resistance of your thermistor. In the basic range finder program at the beginning of this article, we used the formula d = s x t to calculate the distance. In this program, we use the formula that accounts for temperature and humidity (c = 331.4 + (0.606 x T) + (0.0124 x H)). In lines 5-10, the Steinhart-Hart equation is used to convert the thermistor resistance values to temperature, which are stored in a variable called temp. In line 35, we add a new variable (spdSnd) which contains the speed of sound equation. The output from the spdSnd variable is used as the speed in the distance function on line 36. 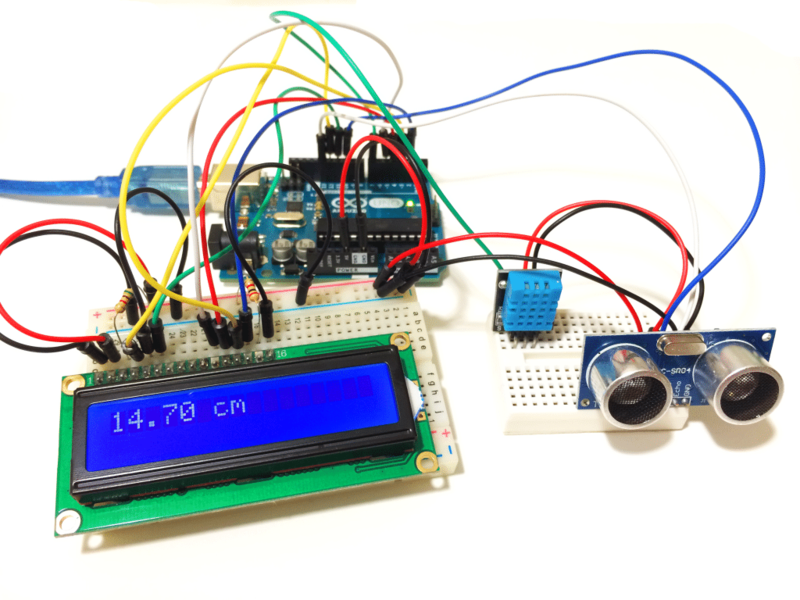 The temperature compensated ultrasonic range finder circuit is pretty accurate for what most people will use it for. However, there’s another factor affecting the speed of sound in air (and therefore the distance calculation), and that is humidity. You can tell from the speed of sound equation that humidity only has a small effect on the speed of sound, but lets check it out anyway. After everything is connected, we’ll need to install a special library to run the code. The library is the DHTLib library written by Rob Tillaart. The library is easy to install. First, download the .zip file below. Then in the Arduino IDE, go to Sketch>Include Library>Add ZIP Library, then select the DHTLib.zip file. The temperature and humidity readings output by the DHT11 are digital, so we don’t need to use the Steinhart-Hart equation to convert the thermistor’s resistance to temperature. The DHTLib library contains all of the functions needed to get the temperature and humidity in units we can use directly in the speed of sound equation. The variables for temperature and humidity are named DHT.temperature and DHT.humidity. Then, speed is used as a variable in the distance equation on line 28. Thanks for reading! Leave a comment if you have any questions about how to set these up. If you like our articles here at Circuit Basics, subscribe and we’ll let you know when we publish new articles. Also, if you know anyone else that would find this article helpful, please share it! This is very helpful, thanks for everything, it was easy to set up. Thx. I was of the grid for a while. Will try it out soon. In the Higher Accuracy Ultrasonic Range Finder circuit, the value of the resistor is the same order of magnitude as the value of your thermistor. Thermistors are available in different resistances (usually 10K Ohm or 100K Ohm). So if you have a 10K Ohm thermistor, your resistor should be 10K Ohm. If you have a 100K Ohm thermistor, your resistor should be 100K Ohm. 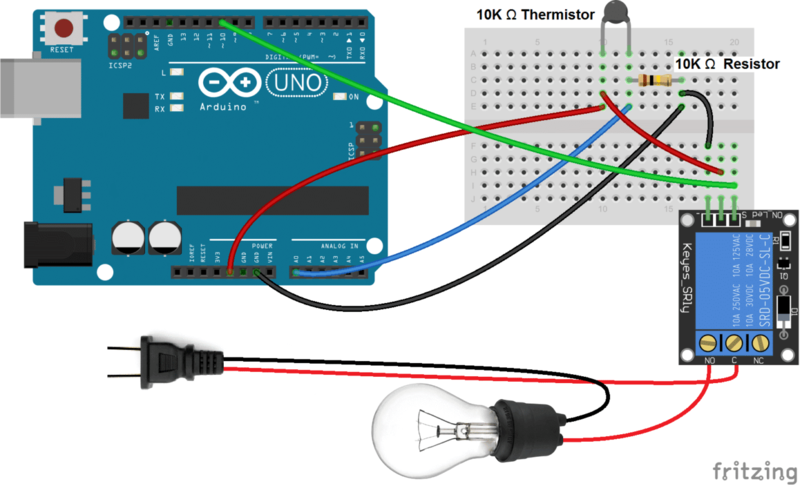 Check out our article on thermistors on the Arduino for more information. I set up the first example and wanted to find out how good the accuracy of the messurement is and add some lines. Works well but why the hack does it show values above and below 3? Sorry hab mich am Schluss aufgeregt ;-D Macht mich echt verrückt – warum funktioniert das nicht! Hi Hans, thanks for that.. Glad you got it going… By the way, which version of the DHTLib library were you using? The version in the zip file above is 0.1.14. I have heard recently that there are problems with the latest version (0.1.21). The resistors for the LCD are for the backlight brightness and screen contrast. I used 220 Ohms for both, but you might want to play around with the values to find something that you like. The code samples only show the first 10 lines. Where can I get all the code? hi i wanted to insert display and then measure distance then how to do that? Which range finder circuit is that happening with? Hi Circuit Basics! Your video was great! I followed all the steps while setting up the Ultrasonic Range Finder (SR04) but as soon as I click Serial Monitor to check the distance being measured I get the same message”Out of Range”. I’ve followed your instructions on the website and the video several times and also tried different types of objects in front of the Ultrasonic Range Finder but that has not helped me. Is it possible that the Ultrasonic Range Finder doesn’t work properly? If it is so, how do I check that? Could you please help me with this? Thanks! HI, I was wondering if someone could help me with this. I am using a HY-SR05 and the distance readings are unstable. In particular, when I point the range finder at myself at a distance of about 40cm, half of the readings come out as “Out of range”. Can anyone help me? hello, what if i want have four HC_SR04 TO calculate the shortest distance of an object?? what will be the code and the circuit?? Hi can I get a lower resolution like in mm, or even lower, by changing the distance formula? If, so, could you provide this math? That’s great Dheeraj, keep up the good work! 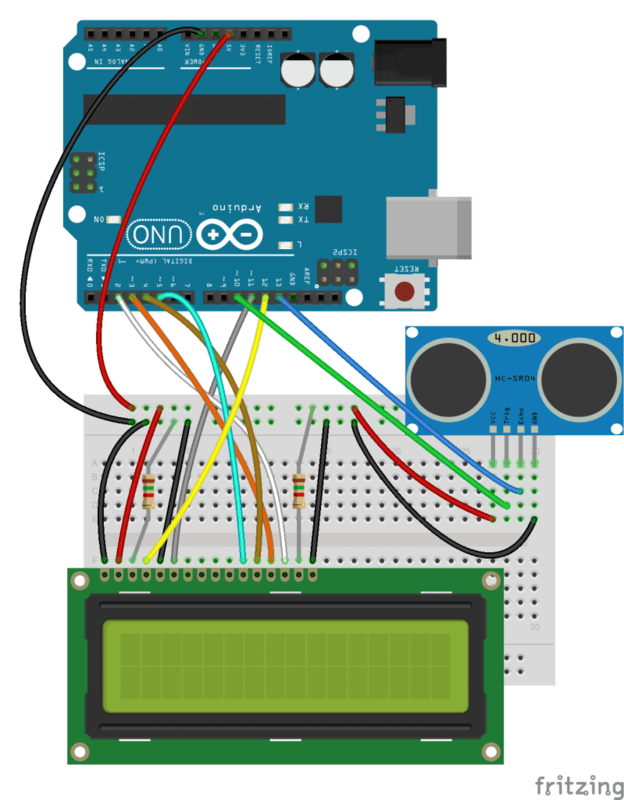 Hi, I would like to know if it is possible to display information from two or more sensors on the same LCD? For example, two ultrasonic sensors pointed to two different directions. Hey could you recommend a way for me to have an LED switch on at a certain distance? This would send a high signal to pin 6 when the distance is greater than 10 cm, and switch it low when the distance is less than 10 cm. I am a first timer at this. uploaded the program and I am getting an error. the program looks like the one in the example? Hi,in your code you forget to read from your DHT11. The Speed will always be 331.4 as you add 0 to it. This is one of the easiest tutorials to follow along with. Great Job! I’m set up with the distance and temp/humidity sensor to my Uno, but my LCD has the I2C converter on it. Any chance you or somebody could help me out with getting to distance displayed on my I2C LCD display? I know how to connect my display to the Uno, just not sure if anything needs to be changed in the sketch to work with my display properly. I hope that all makes sense. can i get the thesis on this project?? 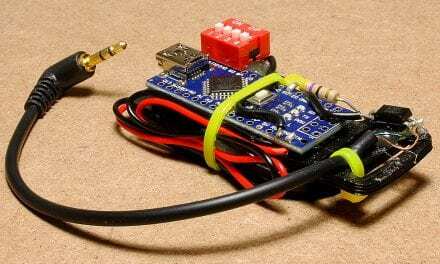 Hey can you send a circuit diagram with dht11, lcd and ultrasonic sensor with breadboard . . .
Great primer and it runs perfectly for me. Where does the 0.0124 come from? I can’t find a primary source anywhere and would love to understand the formula better. I’ve been using the variation of your code with the thermostat and it’s been working perfectly. However, for a project of mine I am needing to hook up multiple Ultrasonic sensors to one Arduino board, could you please help me with the scaling this code to be able to have multiple sensors running from the single board? Thank you for the knowledge you shared above, I am working on the same kind of project, I have used android to display the measures sensor will catch. 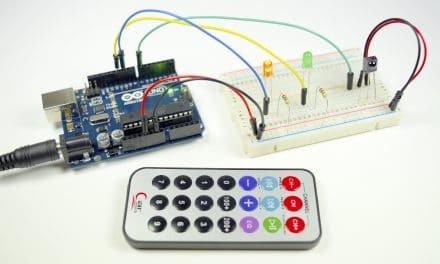 So my question is can I give audio to my android so it could read all the readings, can I give voice to android using Arduino Uno. 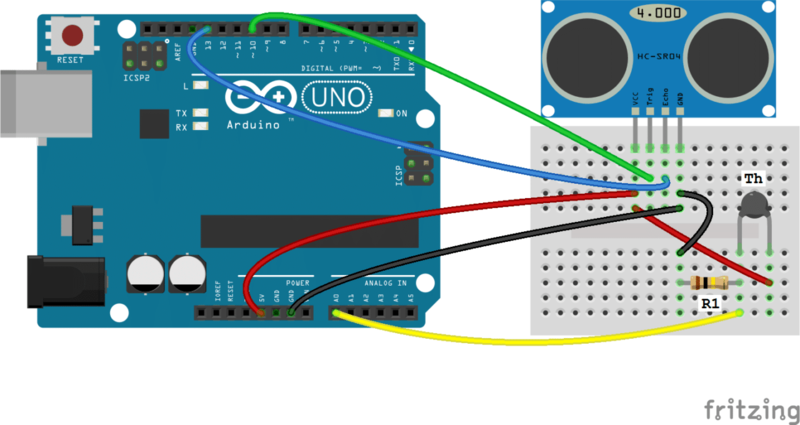 I used Arduino Uno, Ultrasonic Sensor, Bread Board, and Connecting Wires, What in addition we need, to give voice to readings.